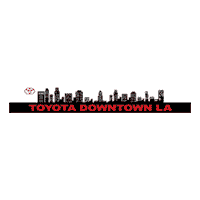 If you need Toyota service but don’t want to break the bank, rely on Toyota of Downtown LA’s service department. We have a revolving door of oil change coupons, brake service coupons, battery service coupons, and more. With our Toyota service specials, you can feel confident you’re getting a good deal. Routine maintenance is essential for your Toyota, and we don’t want you putting off auto repair because it’s too expensive. After you view our Toyota service coupons online, make your way from the Cerritos area to Los Angeles. We want to keep your car running fresh for your trips to the theater and Little Ethiopia, or your next BBQ dinner outing! Receive 12% Off ANY service for vehicles 5 years or older. Max discount $150. Excludes Lube/Oil/Filter service. Coupon has no cash value. Must present coupon at the time of service. Not valid with any other offer. The More You Spend, The More You Save! Coupon has no cash value. Must present coupon at the time of service. Not valid with any other offer. See service advisor for details. *Subject to credit approval. Standard variable Purchase APR of 24.24%, 19.24%, and 15.24% based on Prime Rate and your creditworthiness. Accurate as of 08/01/2017. Please see ToyotaRewardsVisa.com for current terms and costs. Balance Transfer Fee of the greater of $10 or 5% of the amount of the balance transfer. Cash Advance Fee of the greater of $10 or 5% of the amount of the cash advance. Convenience Check Fee of the greater of $10 or 5% of the amount of the convenience check. Foreign Transaction Fee of 3% of each transaction in U.S. dollars. **Bonus of 5,000 points will be awarded to new cardholders accounts. To qualify and receive your bonus points you must make qualifying purchases outside of Toyota dealerships totaling $500 or more within the first 90 days of account opening. Qualifying transactions do not include using your account for Account Assure Pro, balance transfers, cash advances, or using any checks that access your account. To be eligible for this bonus offer, account must be open and not in default at the time of fulfillment. This onetime bonus offer is valid only for first-time Toyota Rewards Visa® cardholders with new accounts. 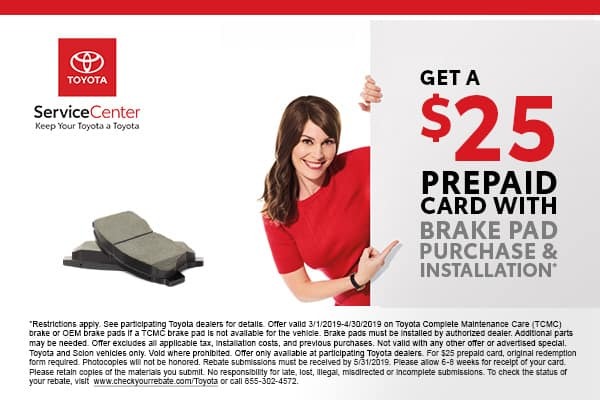 ***The Toyota Rewards Program is provided by Comenity Capital Bank which is solely responsible for the Program operation, including all rewards. Comenity Capital Bank may change the terms of the Program at any time. Please refer to Rewards Terms & Conditions for additional details. ****Each merchant is assigned a code by a third party that indicates the merchant's area of business. Bonus points will only be awarded if the merchant code for the purchase matches a category eligible for the offer. Comenity Capital Bank does not have the ability to control assignment of merchant codes. Visit https://d.comenity.net/toyotarewardsvisa/common/Legal/RewardsTermsAndConditionsDisclosure.xhtml for Toyota rewards terms and conditions. See service advisor for details. *Subject to credit approval. Standard variable Purchase APR of 24.24%, 19.24%, and 15.24% based on Prime Rate and your creditworthiness. Accurate as of 08/01/2017. Please see ToyotaRewardsVisa.com for current terms and costs. Balance Transfer Fee of the greater of $10 or 5% of the amount of the balance transfer. Cash Advance Fee of the greater of $10 or 5% of the amount of the cash advance. Convenience Check Fee of the greater of $10 or 5% of the amount of the convenience check. Foreign Transaction Fee of 3% of each transaction in U.S. dollars. **Bonus of 5,000 points will be awarded to new cardholders accounts. To qualify and receive your bonus points you must make qualifying purchases outside of Toyota dealerships totaling $500 or more within the first 90 days of account opening. Qualifying transactions do not include using your account for Account Assure Pro, balance transfers, cash advances, or using any checks that access your account. To be eligible for this bonus offer, account must be open and not in default at the time of fulfillment. This onetime bonus offer is valid only for first-time Toyota Rewards Visa® cardholders with new accounts. ***The Toyota Rewards Program is provided by Comenity Capital Bank which is solely responsible for the Program operation, including all rewards. Comenity Capital Bank may change the terms of the Program at any time. Please refer to Rewards Terms & Conditions for additional details. ****Each merchant is assigned a code by a third party that indicates the merchant's area of business. Bonus points will only be awarded if the merchant code for the purchase matches a category eligible for the offer. Comenity Capital Bank does not have the ability to control assignment of merchant codes. Visit https://d.comenity.net/toyotarewardsvisa/common/Legal/RewardsTermsAndConditionsDisclosure.xhtml for Toyota rewards terms and conditions. Toyota of Downtown LA	34.0341079, -118.2750452.